Brad Pitt and Angelina Jolie were conspicuously absent from bff George Clooney's wedding to Amal Alamuddin and Brad gives conflicting answers when asked about it. He missed the wedding due to his shooting schedule and working honeymoon in Malta. But Brad Pitt hasn't forgotten about George Clooney's nuptials in Venice last month or a gift for his pal and new bride Amal. The 50-year-old admitted in an interview with Access Hollywood that he 'still owes him something' but he's not sweating it as tradition holds he has up to a year give the bride and groom a token. 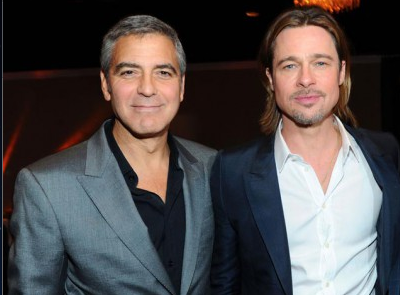 Brad & George look like "domestic life partners" in that pic. Maybe they should've gotten married to each other instead.